The Marauder: he’s a big tanky guy who shoots rockets from his arms. He may act all tough on the battle field, but I’m pretty sure he’s just a squishy guy underneath all of that gritty armor. I’m even sure that he owns a little cat named “Mr. Sniffles” and enjoys a good soap opera now and then. I actually have no idea what I’m talking about, but I do like having marauders in my army composition. 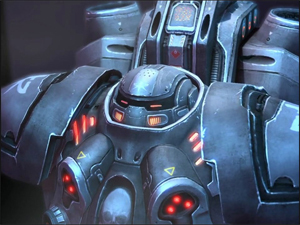 When I was laddering nonstop, my standard go-to build against toss was SeleCT’s 2 Rax Pressure into expand. It was definitely a good build, however, it’s become a little outdated now. Now it’s all about the 1 rax or the CC first into tons and tons of marines. But what about the marauders? Don’t leave them hanging! Let’s pay homage to the chubby little marauder with this sandwich. Load up your marauders into your medivac sandwich and shift queue this medivac sandwich directly into your mouth. Total prep time will be about ~30 minutes. Total cook time will be about 45 mintuess. This recipe will serve 4 people. Set oven to 375° F (190° C). Mince garlic and onion into fine pieces. Combine salt, pepper, oregano, parmesan, onion, worcestershire sauce, and garlic with the ground beef. With a table spoon, portion out the meat and shape into balls. Place meatballs in a baking dish. Cook for 45 minutes or until golden. 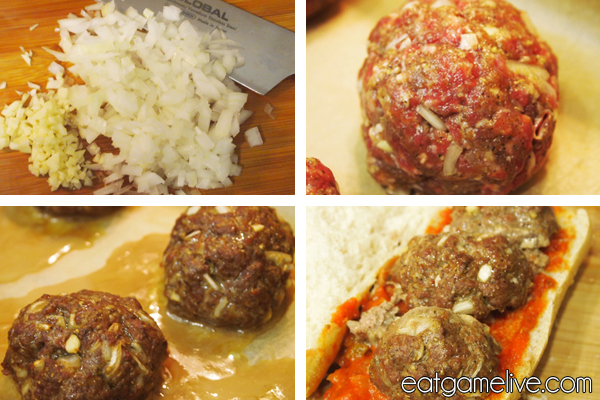 These instructions for meatballs might look familiar… If they do, it’s because they are! They’re the same instructions used in Winter Meatbomb Soup. Slice your sandwich rolls in half. Set your oven to broil (or 500° F / 260° C). Place sandwich rolls in the oven and let them toast for a few seconds. Place marinara sauce in a pan and set on high heat. Allow sauce to warm and then remove from heat. Spread sauce onto warm sandwich rolls. 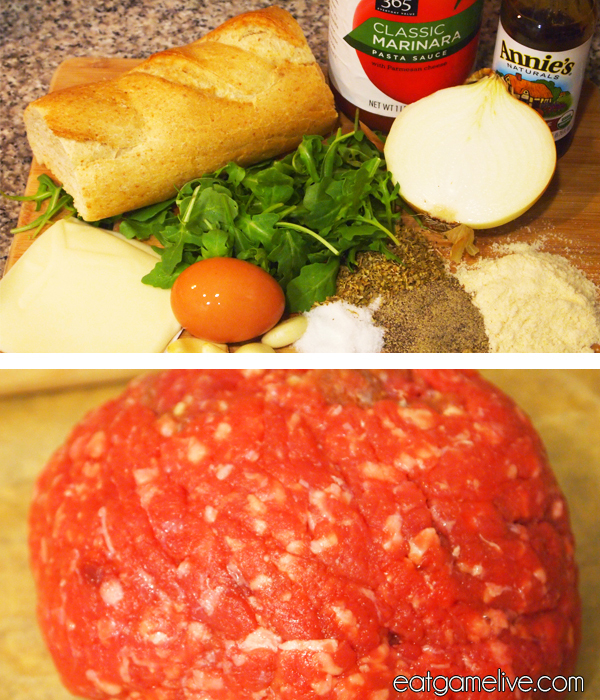 Slice your meatballs in half and place them on the bread. Place mozzarella slices over the meat. Place sandwich in the oven (at broil or 500° F / 260° C) to allow mozzarella to melt. This should take about 40 seconds. 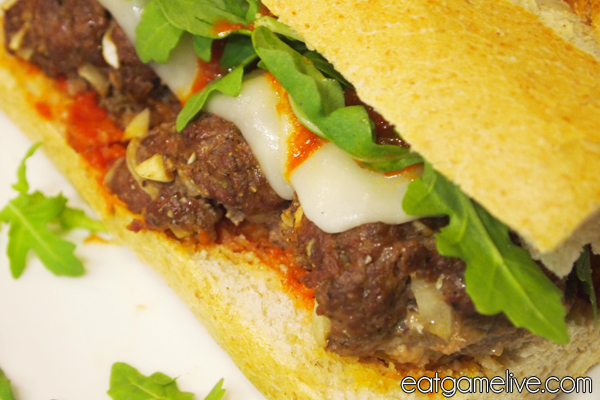 Remove sandwich from the oven and drizzle marinara sauce over the cheese. Place arugula over the cheese and finish with the sandwich top. Om nom nom nom. GG WP! I would not suggest eating this sandwich while microing your marauders because this sandwich is extremely messy. You will need impressive stutter-step to prevent this sandwich from dripping everywhere. However, it’s totally worth it. This entry was posted in sandwich, starcraft and tagged marauder, marinara, meatball sandwich, meatballs, sandwich, terran by admin. Bookmark the permalink.